Super Bowl: Atlanta's Pledge To Clear Homeless Camps Fuels Anxiety Just two weeks before the Super Bowl, the city said it would work to clear homeless encampments. Officials say the move is unrelated to the game, but it has created a lot of uncertainty. Tony Hines said a rumor that anyone sleeping in encampments under bridges could face arrest is sparking fear. About a dozen people, bundled up in coats and beanies, are reading Scriptures in downtown Atlanta's Woodruff Park. They're part of a Bible study for the Church of the Common Ground. The church always meets outdoors. So one parishioner wonders during the lesson how the Super Bowl might affect their services. "If they're shutting down the streets here," she asked, "how are we supposed to have church on Super Bowl Sunday?" Pastor Monica Mainwaring isn't totally sure. The Super Bowl has created a lot of uncertainty for the people the church serves, who often are homeless. Rumors about what will happen to people in Atlanta's homeless encampments have been swirling ahead of Super Bowl weekend. One of the Bible study attendees, Tony Hines, knows the rumors well. He has spent years living on the streets and is now hoping for housing. "This is what I've heard," he said. "I heard if you get caught under bridges, you are going to jail." Hines said that talk has made people anxious. "People are scared because no one wants to be locked up thinking they had their freedom taken away," Hines said. I think there's a concern that the city wants to look prettier than it is. "I think there's a concern that the city wants to look prettier than it is," Pastor Mainwaring said, "or like it has less of an issue with people experiencing homelessness than we do." The problem for Mainwaring is, although she can't confirm the rumors, she also can't refute them. Just two weeks before the Super Bowl, the city held a press call and said it would work to clear encampments. "I think a lot of social service agencies and people who work with people experiencing homelessness thought why right now and asked that question," Mainwaring said. And for people like her, the city's answer hasn't cleared up the confusion. Officials have said there has always been a law against encampments, also known as urban camping, and Atlanta has always enforced it. In an interview with WABE, Mayor Keisha Lance Bottoms was emphatic. "This has absolutely nothing to do with the Super Bowl," Bottoms said. "If it did, I would say it." Instead, the city has said clearing encampments is about public health and safety — consider, for example, the risks of lighting fires under interstates. The city has also stressed that the goal is not to make arrests. Deputy Chief Operating Officer Jon Keen said teams are giving advance warning to those in the camps. "And at the point of time we're actually clearing the encampments, we're also offering services and offering transportation," Keen said. But even if those are the city's intentions, some providers have said the strategy contradicts Atlanta's own work on homelessness. Encampments can include those hardest to reach — people who have been living outside for some time and may deal with mental illness. Cathryn Marchman, executive director of Partners for HOME, a city-commissioned nonprofit that leads Atlanta's strategy on homelessness, said helping those people requires trust. "We know that outreach work to unsheltered individuals is slow and steady," she said. "It takes quite some time, in many instances, to move somebody who's been living outside to housing, but that is our goal." 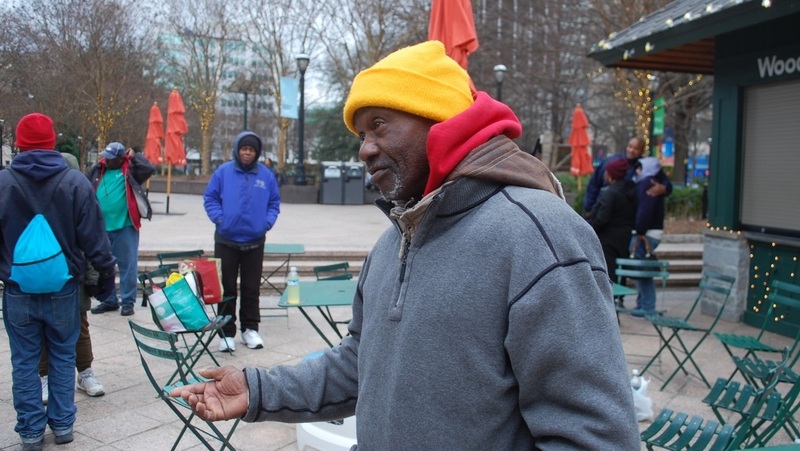 It's why Atlanta is funding a new five-person team to focus specifically on street outreach. Marchman admitted that process of building relationships doesn't include sweeping encampments. "I think if people are being moved from place to place then it can make that work more challenging," she said. Still, while providers may be struggling to interpret the city's stance on encampments, national observers can find it less perplexing. Eric Tars, legal director of the National Law Center on Homelessness and Poverty, is accustomed to cities hiding people who are homeless before major sporting events. "It's very understandable why the city might be trying to put the best spin on, what you know, really an appalling policy on its face," he said. But Super Bowl or not, Tars said the policy is becoming tricky legal territory. Last fall, a federal court ruled that cities can't stop people from sleeping outdoors if there is no place for them indoors. In a letter last week, the Southern Center for Human Rights reminded Atlanta of the ruling and argued it only has shelter beds for less than half of its homeless population. The city has disputed the group's numbers, saying it has roughly 2,800 beds, not including those activated for cold weather. In 2018, volunteers found just over 3,000 individuals to be homeless in Atlanta. For now, those at the Church of the Common Ground are waiting to see what happens. That includes Hines, who is expecting to be placed in housing after years of staying on the streets. He and Pastor Mainwaring said how Atlanta treats the homeless during big tourist events matters. "It's important because it says something about who we are and how we are in relation to poverty and need and poor mental health and addiction," she said. Mainwaring said those are problems that we know are not solved in a day — or perhaps even a Super Bowl weekend.